Had an odd dream last night. I dreamt I was playing street basketball at some park. Kinda odd. I don’t actually do that. Last time I played basketball was probably more than 10 years ago. Sure I’ve shot a few hoops but actually played played with teams and points; probably more like 17 years ago. There was another part to my dream. I think it was more in my waking dream. I remember waking up at 2:20am, so I think there were some moments of lucidity. I was organizing objects into groups. Not sure what they were. They kinda feel like Starcraft terran units. But I really can’t remember. I just remember waking up at 6am feeling confused about what I just dreamt about. Anyways, Heart of the Swarm came out today at 3am. Maybe I should have called in sick today. I know u shouldn’t have, but I played the first mission while getting ready for work. And yeah, now I’m probably going to be late getting into the office. I’m on the bus now though. The game looks good. Can’t wait to mess around with the new units. There’s some sick things now availavle for the Zerg. The game I’ve been waiting for. 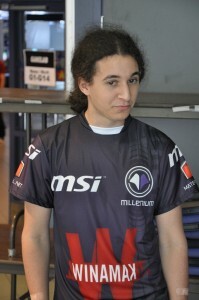 Millenium Stephano on the main stage. oh man. Stephano 1 – Polt 2. Man Game 1 was a hard battle for Stephano who eventually loses to just too many tanks. Game 2 was a complete turn around totally in favor of Stephano. But in Game 3 Polt pulls some quick unconventional build and Stephano, not having scouted it, gets mowed over. Ugh. So heart wrenching. Come on Millenium Stephano you can pull though in the lower bracket! I know you can!